"Taken in 1898, this photograph of Railroad Avenue (now North Avenue) depicts what much of the area across from the railroad station looked like until the 1940's. Pictured, from left to right, the old Walton homestead, George L. Teague's store, the Gilman Drug Store (subsequently Nat Eaton's Drug Store), and the Thorndike Market. 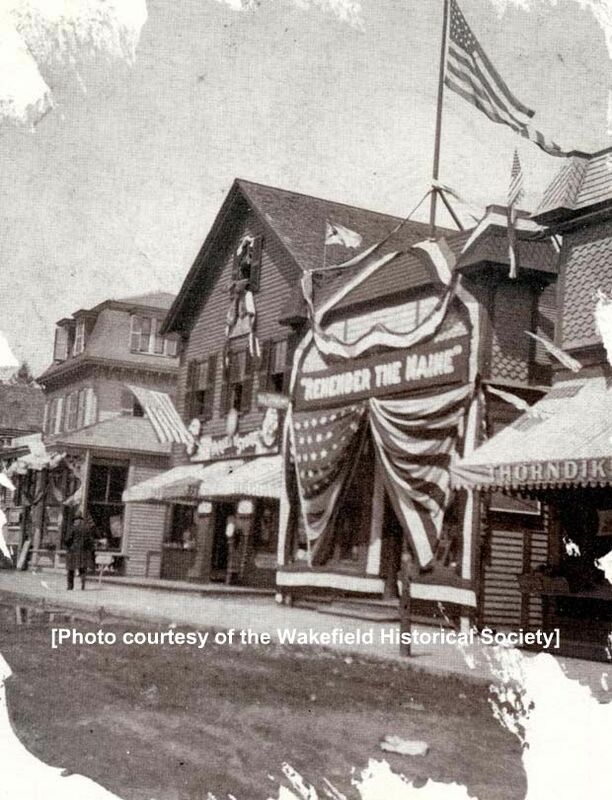 The stores were decorated for the departure of the Co. A, 6th Regiment which left Wakefield for the Spanish American War. The flag was raised in May, 1898. It was reported that before the flag was raised, a dummy of Spanish General Weyler was 'pulled to the peak and blasted to pieces with shotguns and revolvers using live ammunition.'" -- Text from calendar by Jayne M. D'Onofrio. “North Avenue, 1898,” NOBLE Digital Heritage, accessed April 22, 2019, https://digitalheritage.noblenet.org/noble/items/show/7037.